Soft, silky and sumptuous, this gorgeous organic cotton king sized fitted sheet from Natural Collection has a subtle stripe and lovely sheen, making a truly special addition to our organic bedding range. Ecru cotton - manufactured with no chlorine or optical brighteners. Dimensions: 152cm x 198cm. With 25cm fabric on each side, to fit mattress with an approx depth of between 15cm and 18cm. 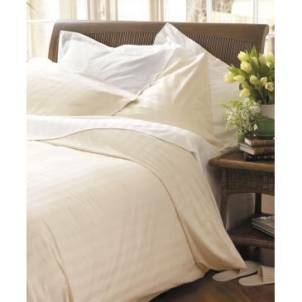 The Natural Collection Organic Cotton King Fitted Sheet - Ecru product ethics are indicated below. To learn more about these product ethics and to see related products, follow the links below. Nice thick cotton in a nice ecru colour. It feels soft and it looks really nice on the bed with the complete set. Seems to be a good fit, and very soft. Very beautiful and so soft! I was surprised at the wonderful feel of this material - even better than sheets I have bought from you in the past. There are currently no questions to display about Natural Collection Organic Cotton King Fitted Sheet - Ecru.